Google has introduced a new program called ‘Designed for Families’, which is essentially a new classification for showcasing pre-approved, kids-safe apps on their Play Store. All Android developers are now required to submit their apps for review under this program, and once cleared, they will be able to highlight their apps under this new classification. 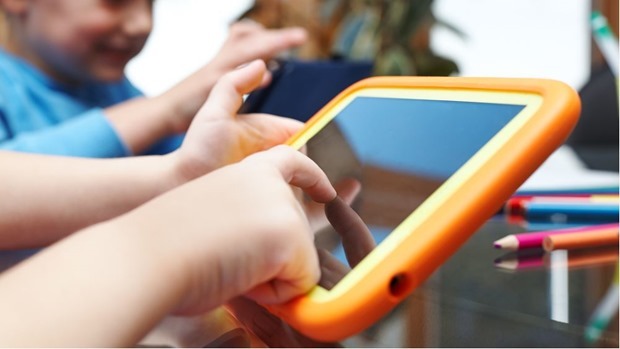 Experts are stating that not only this new program will make the discoverability of kids-safe app more prominent and easier, but also help parents make faster decisions related with the apps which their kids wants to use. Google today sent following mail to all app developers, so that they offer ratings to their existing apps as well. In 2013, Apple had introduced a similar ‘Kids Section’ on their App Store, which was targeted especially for iPad users as usage among kids skyrocketed in the last few years. 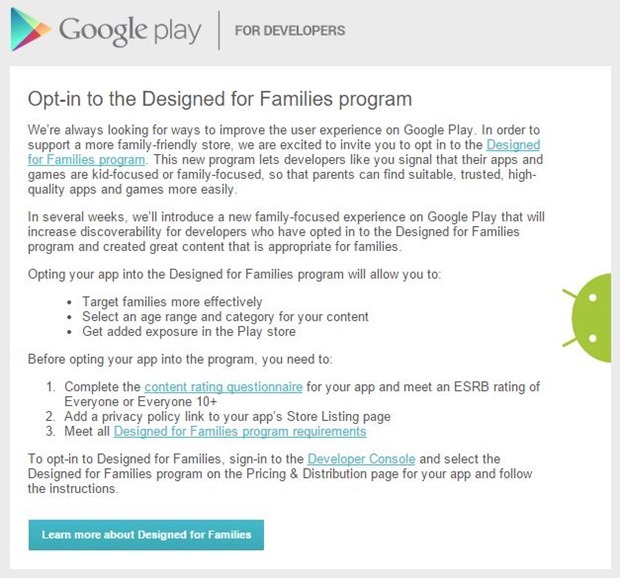 Google’s ‘Designed for Families’ programs follow more or less similar rules which Apple has enforced such as only one ad placement, no behavioral advertisements (ads which are based on in-app actions/activities) and no remarketing. Last month, Google had introduced sweeping changes to their rating system, as they partnered with a global rating agency for a universal, and globally accepted rating system. Designed for Families program is an extension of this new rating system. Here are all the guidelines for Designed for Families program. Earlier this year, Google introduced Youtube Kids App, which was designed for showcasing content meant for children. But last week, Google ran into trouble after activists found that mature content was mixed with kids’ content in this app, and even worse: advertisements meant for adults were being shown there. The case is still being investigated by US courts. Last year, Google paid $19 million to settle a suit which was filed to reimburse parents whose kids purchased and downloaded Google Playstore apps without their parent’s consent. In January, 2014, Apple paid $32 million to settle a similar case. It seems Google has learnt their lessons well, and introduced a compact, and highly detailed program to filter out content related with kids. Opera Mini 8.0 Update Released For Android, User Base Expected to Double by 2017! Google May Soon Setup Cache Servers in India For Quicker Search Results & YouTube Videos!